Today was one of those off days at school – lots of students out of class for one reason or another – so I decided to delve into the Comparisons standard and get us involved in a Twitter event for Là na #Gàidhlig. We talked briefly about the status of Gaelic in Scotland and how social media events like Là na #Gàidhlig help build awareness and strengthen cases for linguistic equality. It’s an easy perspective for my students to understand, given that they’re required to use a second language every day. We also talked about how a few Gaelic expressions appear in English, like gleann “glen” and clann “clan, children”. Next, I put a list of Gaelic words on the board, along with their meaning in French. The list included some words borrowed into English, some high-frequency words, and some related to popular interests among my students. 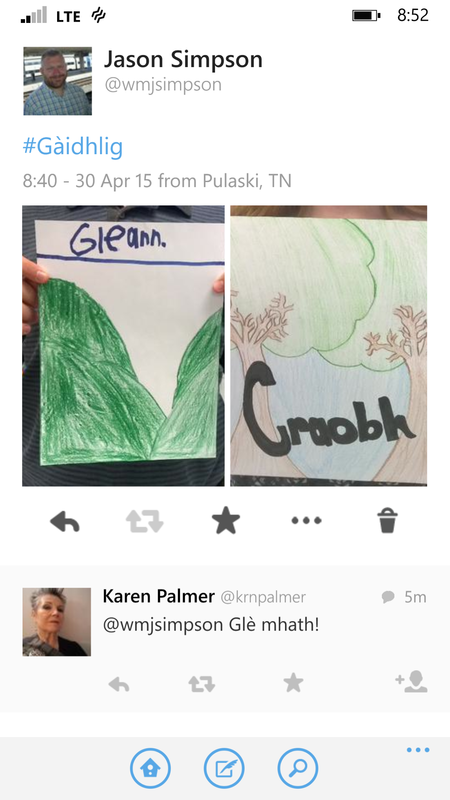 The students made a picture card for the word of their choice, and then I tweeted their work with the hashtag #Gàidhlig. They really enjoyed watching other Gaelic speakers and learners “favorite” and comment on their work! This was one of our simplest activities ever, but the student participation was outstanding. It’s always exciting to see students get creative with new material. One student turned Clash of Clans into Connsachadh nan Clann with two babies fighting!